Rep. Jim Himes (D., Conn.) said Monday he disagrees with the Democratic National Committee's decision to exclude Fox News from moderating any of the debates during the Democratic primary. 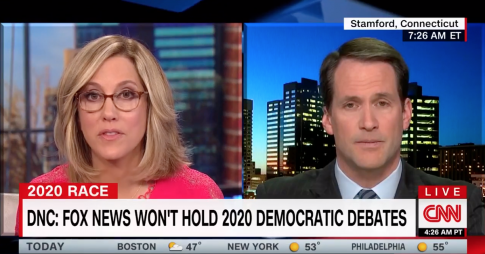 "Well, with all due respect to the DNC, no, I don't think it was the right decision," Himes told CNN's Alisyn Camerota on New Day. Last week, the DNC chairman Tom Perez announced that Fox News wouldn't be a media partner for a 2020 Democratic primary debate. They cited The New Yorker report which described a close relationship between the Trump administration and Fox. That article has come under scrutiny for alleged factual inaccuracies, although Himes said he doesn't trust Fox News but merely wants to reach its "millions and millions" of viewers. "You know, look, it's no surprise to anybody, including to Fox News watchers, that Fox is largely an instrument of the right wing, of the Republican Party. It's a propaganda arm for the White House," Himes said. "However, and the reason I go on Fox, is that it's watched by millions and millions of Americans."